June 1836 invoice between the parties of Fogg & Davis and Bangor Despatch Line, for the transport of one barrel on the Schooner Tremont. The cost was $.24. Fogg and Davis operated out of Bangor, Maine. The reverse mentions Freeport, which is presumably Freeport, Maine, located about midway between Bangor, Maine, and Boston, Massachusetts. It could possibly be Freeport in the Bahamas. Interestingly, I found mention that the Schooner Tremont was one of the vessels lost in the gales of December 1839. The Tremont and her cargo were lost off Hampton Beach, New Hampshire, but her crew was saved. The Fogg of Fogg & Davis may have been one or more of the sons of Meshach Fogg and Abigail (Whittier or Witcher) Fogg of New Hampshire : Greenlief Fogg; Noah Fogg; Jesse Fogg; Luke (Witcher or Whittier) Fogg; Ransom Pike Fogg; Nathaniel Upham Fogg; and Benjamin Greeley Fogg. Some, if not all of them, lived at Bangor, Maine, at some point. See another post that features an account book from the 1830s at Bangor, Maine, that I believe was owned by one of the Fogg brothers. One entry made reference to N. Fogg & Davis, so the Fogg brother involved in Fogg and Davis may have been Noah or Nathaniel. At least two of the Fogg brothers are buried at Mount Hope Cemetery at Bangor, Maine. Others went west. If you have more information on "Fogg & Davis", please leave a comment or contact me directly. Sorry about the map below - the route would have consisted of a trip from Bangor downriver on the Penobscot and then by sea to Freeport, Maine, and Boston, Massachusetts. 10" by 6-3/4" colorized or color photograph taken from the camp of Clara Dixon Blodgett at Joe's Pond at Danville, Vermont. The photograph was taken in 1920 or 1970; see the date below. If 1920, it may have been colorized. Clara Columbia Dixon was born June 19, 1863 at Jericho, Vermont, the daughter of Ashton Clark Dixon and Columbia B. (Day) Dixon. 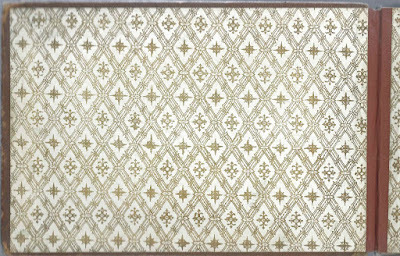 Clara married Fred Elijah Brainerd, son of George and Martha L. (Hale) Brainerd at St. Johnsbury, Vermont, on September 27, 1883. Sadly, Fred, who was working with his father in the family grocery business, died of consumption in March of the next year. On October 21, 1891, at St. Johnsbury, Vermont, Clara married Pearl Freeman Blodgett, son of Pearl Davis Blodgett and Laura Ann (Freeman) Blodgett. Pearl, who was born November 27, 1850 at Salem, Massachusetts, worked in insurance. He died in 1923 and Clara in 1943. Two photographs of a young girl identified on the reverse as Mabel Louise Rowe in one and Mabel Rowe in another. The photograph above was taken at the Gerrity & Co. studio at Bangor, Maine. 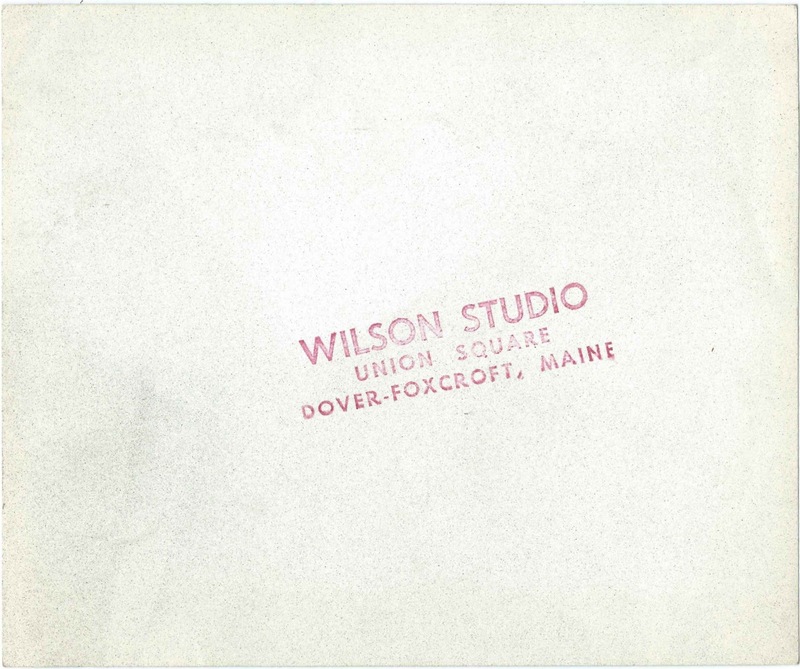 The photograph below was taken by the Chalmers studio of Bangor, Maine. Thankfully, the top photo contains her middle name, to differentiate her from several other Mabel Rowes in the Penobscot County, Maine, area. There were at least two women born in the Bangor, Maine area, named Mabel L. Rowe. One was Mabelle L. Rowe, also shown as Mabel L. Rowe, born about 1885, the daughter of Herbert W. and Tillie E. (Johnson) Rowe. She graduated from Bangor High School in 1903. It seems more likely to me, however, that the photographs were taken of a Mabel Louise Rowe born in a later era. A good possibility is Mabel Louise Rowe, born in 1900, the daughter of Arthur Irving Rowe and Emma Leola (Clewley) Rowe, from, I believe, Brewer, Maine, or possibly Eddington, Maine. Emma Leola died in 1907. Arthur married Melvina Rich Smith, "Mellie", in 1914. Sadly, this Mabel Louise Rowe died in 1923 and is buried with her parents in the Pine Hill Cemetery at Eddington, Maine. If you have corrections and/or additions to the information above, or if you recognize Mabel from your family photographs and research, please leave a comment or contact me directly. Three mounted photographs of a college dormitory room, two of them with students. Each photograph was taken by the studio of Leon A. Luce of Farmington, Maine. Sadly, there's no identification of the men shown, and there's nothing written on the reverse of the photographs. 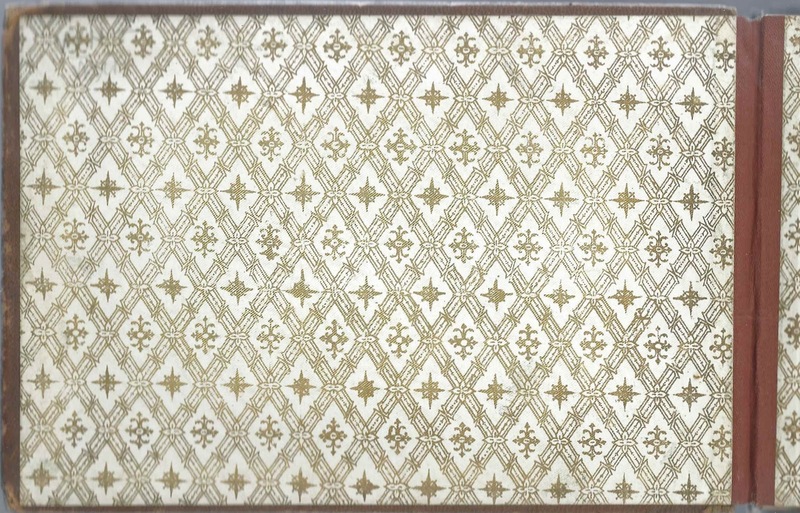 Each photograph is approximately 7-1/4" by 5-1/4". With their mats, they're about 9-3/4" by 7-3/4". If Leon didn't stray far from his studio, the photographs might show the room of students at what was then known as Farmington State Normal School and is now University of Maine Farmington. If, however, Leon traveled, the photographs could have been taken at another college or university. In the event that the men were members of the fraternity Zeta Psi, shown on a pillow in the photograph below, it's interesting to note that this fraternity had chapters at Bowdoin College and Colby College. Further, the large Bowdoin banner in the sleeping nook might favor Bowdoin College as the venue. On the other hand, Leon A. Luce, who started his studio in 1912, had a strong connection to Bates College, as he had graduated from there in 1910. 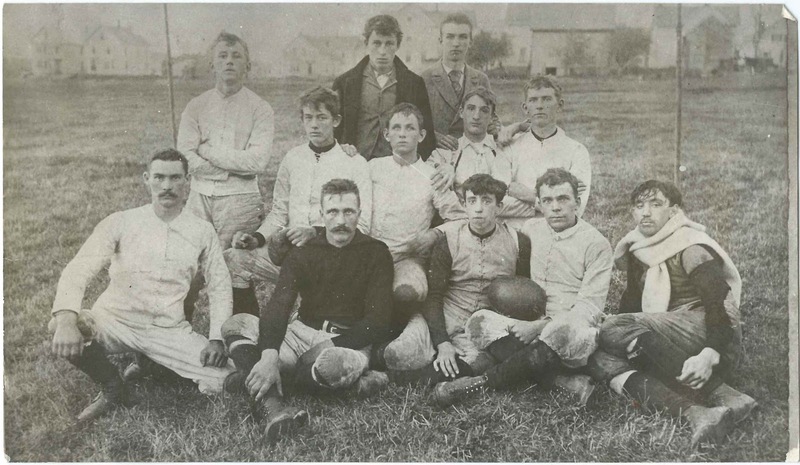 If you recognize the men and/or surroundings, or if you have a theory as to which college these men attended, please leave a comment or contact me directly. c1900 photograph of the drug store owned by Frederick Elmer Sprague, "Fred", of Bangor, Maine. Perhaps the men shown are Fred and his son Adelbert Wells Sprague. Identification on the reverse indicates that the store was at the corner of Clinton and Hammond Streets, though that may refer to Grace Methodist Church, which is also mentioned. According to his birth and death certificates, Frederick Elmer Sprague "Fred", was born April 4, 1844 at Dexter, Maine, the son of Henry Augustus Sprague, born at Dexter, Maine, and Eliza (Cleaves) Sprague, born at Paris, Maine. Fred and his wife Hattie C. Sprague had at least one child, son Adelbert Wells Sprague, who became a music professor at the University of Maine and eventually head of the music department there, as well as conductor of the Bangor Band for 41 years. 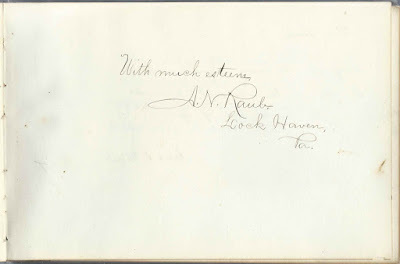 While still a student at the University of Maine, Adelbert arranged a tune that he thought would do well for a school anthem and asked his friend Lincoln Colcord to compose some lyrics. The result was the rousing Maine Stein Song. If you'd like to hear Rudy Vallee, who attended the University of Maine in the 1920s, sing the Maine Stein Song, advance to the 1.16 minute mark. January 1, 1867 document wherein the three selectmen and the town clerk of Gouldsboro, Maine, attest to the good character of Walter Sargent, then serving as an Acting Master in the U.S. Navy. The document takes up one pane of a large sheet of paper folded once. Folded, it's nearly 10" by 7-3/4". We the undersigned municipal officers of the town of Gouldsboro, Maine, certify that we have known Walter Sargent (now Act'g Master in U.S. Navy) from his childhood and that he has always sustained an unblemished character and possesses such integrity, industry and moral worth as to merit and secure the interest and esteem of all his townsmen. Walter Sargent may have been the the U. S. Navy Lt. Walter Sargent mentioned in Historical Researches of Gouldsboro, Maine, published by the Daughters of Liberty in 1904, as having perished with others when his vessel went down off the coast of Japan. The mention didn't include a date, so it's possible that Walter was another of the several Walter Sargents in the Gouldsboro area. 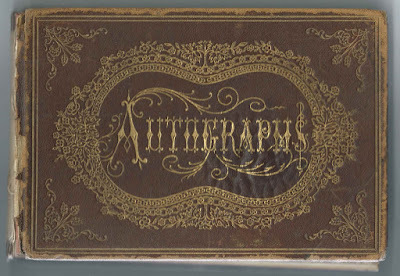 The Walter Sargent in the document was likely the Walter born about 1841 to Samuel H. Sargent and Sarah (Moore) Sargent. Samuel was the second keeper at the lighthouse at Prospect Harbor, a community on the Gouldsboro peninsula. B. M. Sargent was presumably Benjamin M. Sargent, born on July 23, 1832 at Gouldsboro, Maine, and the older brother of the Walter Sargent in the previous paragraph. Benjamin, who died in 1870, is buried with his parents and brother George in the Prospect Harbor Cemetery, in Prospect Harbor. I don't know if he had married. William Rand may have been the William Rand who was born September 8, 1818, the son, I believe, of Stephen Rand and Nancy (Adams) Rand. William's first wife Sophronia (Newman) Rand died in 1864; he then married Mrs. Marian (Pettee) Robinson in 1865. William, who died in 1911, and his wives and some of his children are buried in the Brookside Cemetery at Winter Harbor, Maine. Jacob Foster Jones was born March 28, 1826 at Gouldsboro, Maine, the son of Abijah and Catherine Jones. He married Abigail Spurling, daughter of Thomas and Prudence Spurling. They had three children. Both Jacob and Abigail died in 1877. H. M. Sowle was presumably Hilliard Mayhew Sowle, born January 20, 1803, son of Ebenezer Vose Sowle and Deborah (Mayhew) Sowle. Hilliard married twice: 1) Abigail Wilson, who died in 1845; and 2) Flora H. Whitaker, who outlived him. I believe Hilliard had five children with his first wife, one of them named for him, but that child lived only a few years. Hilliard, Sr., died in 1882; he is buried at West View Cemetery with his wives and several of his children. 1908 photograph of students and teacher(s) taken by the Harvard Photographic Studio of Deer Isle, Maine. The photograph was presumably taken on Deer Isle or Little Deer Isle, but the photographer may have visited schools on the mainland. The reverse has the name of Helen Clark and very faint initials for what I imagine are names of other people in the photograph. A little tweaking reveals a bit more, and I can read the words "when picture taken", as well as . If you recognize a Helen Clark and/or any of the people in the photograph from your own collections of family photographs and research, please leave a comment or contact me directly. c1900 photograph of teacher(s) and students at George Stevens Academy at Blue Hill, Maine. The Academy is still in existence today. The photograph itself measures a bit over 5" by 7"; matted, the piece is about 8" by 10". 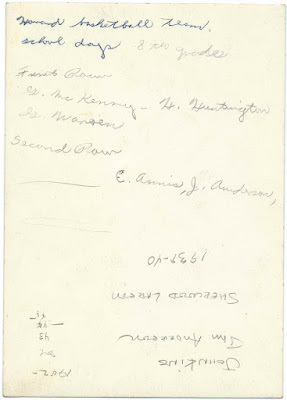 There's faint handwriting on the reverse: "George Stevens Academy, Blue Hill, Maine, c1900". The link to the George Stevens Academy website above gives a history of the academy, from its origins as Blue Hill Academy in 1803. George Stevens, an Andover, Massachusetts, native, was a Blue Hill shipowner, merchant and philanthropist. If you can identify anyone in the photograph, from your family photos and research, please leave a comment or contact me directly. Thanks! 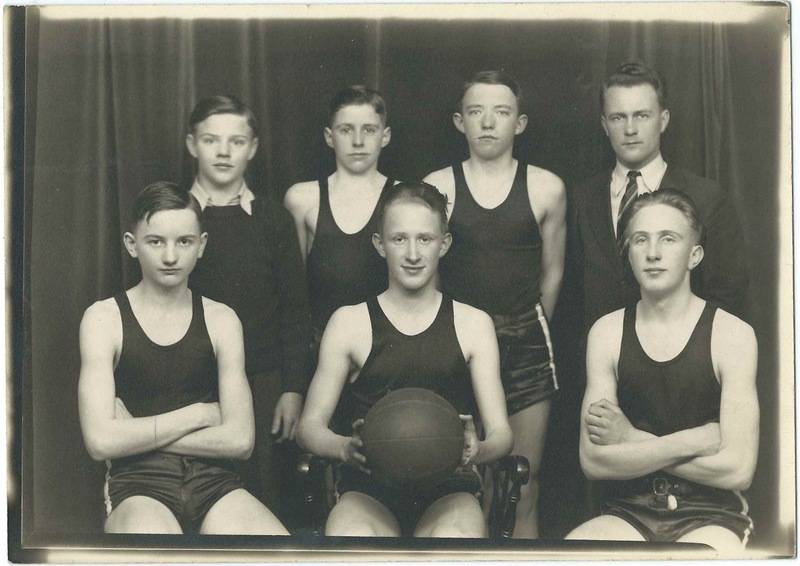 Five sports-related photographs from teams at Dover-Foxcroft Grammar School and Foxcroft Academy at Dover-Foxcroft, Maine, two from around the turn of the century and three dating to between 1939 and 1944, with Howard Eugene Huntington appearing in those three. 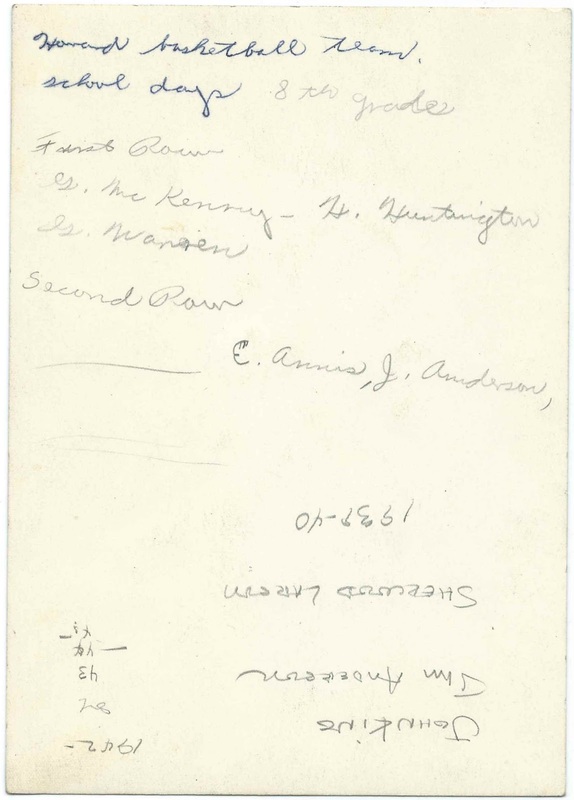 J. Anderson, presumably James David Anderson, "Jim"
Johnkins - perhaps Junkins or ? Sherwood Larson. 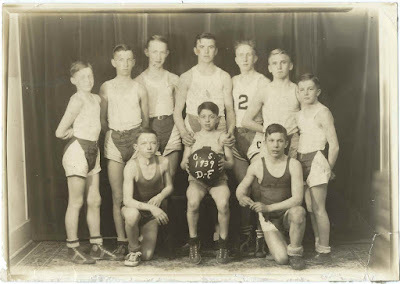 Sherwood Larson, born about 1916, was presumably the coach, back row, right. 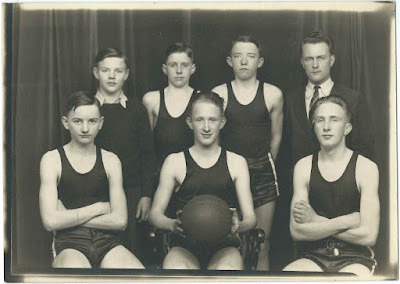 1939 basketball team of Dover-Foxcroft Grammar School; Howard Eugene Huntington is one of the team members, possibly back row, third from left. Photograph of Howard's winning cross country team at Dover Foxcroft, presumably in the early 1940s. 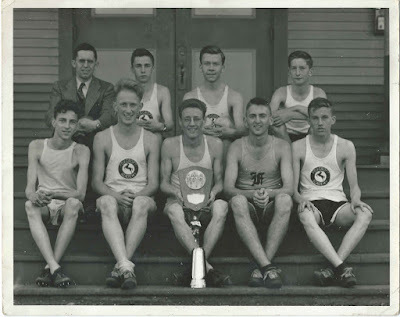 The team won national championships in 1942 and 1943; Howard was on the 1943 team, and perhaps also on the 1942 team. 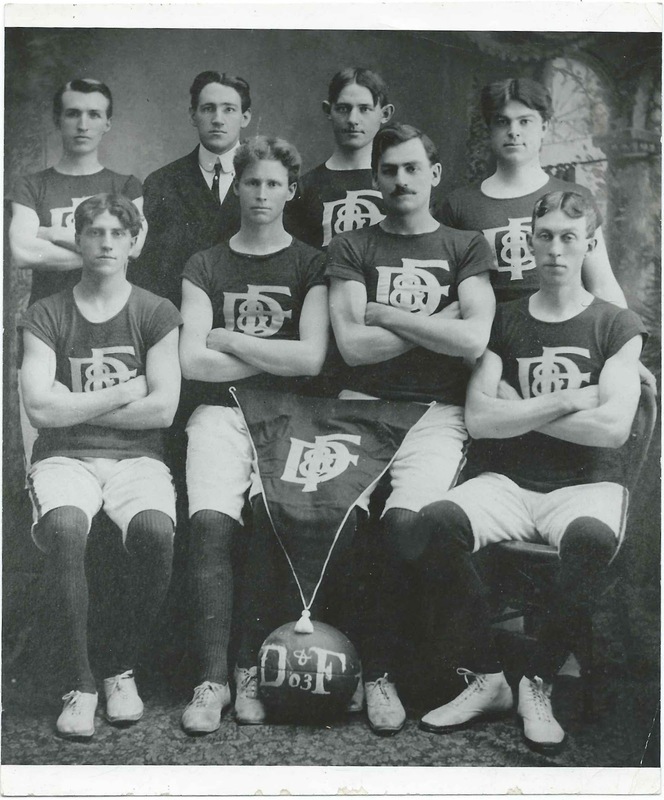 Two other photographs appear to be from an earlier period at Foxcroft-Academy, one of a 1903 basketball team and another of a football team. 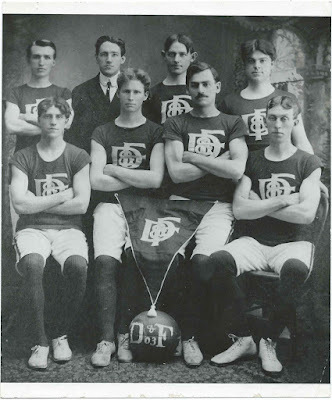 The photograph of the D & F basketball team has the stamp of the Wilson studio of Dover-Foxcroft on the reverse, so perhaps it's a copy of an earlier photograph, as Dover and Foxcroft didn't merge into one municipality until 1922, unless the hyphenated name was in parlance before then. Luckily, the Foxcroft Academy website contains a copy of the photograph of the 1893 football team, below, and the young men are identified. 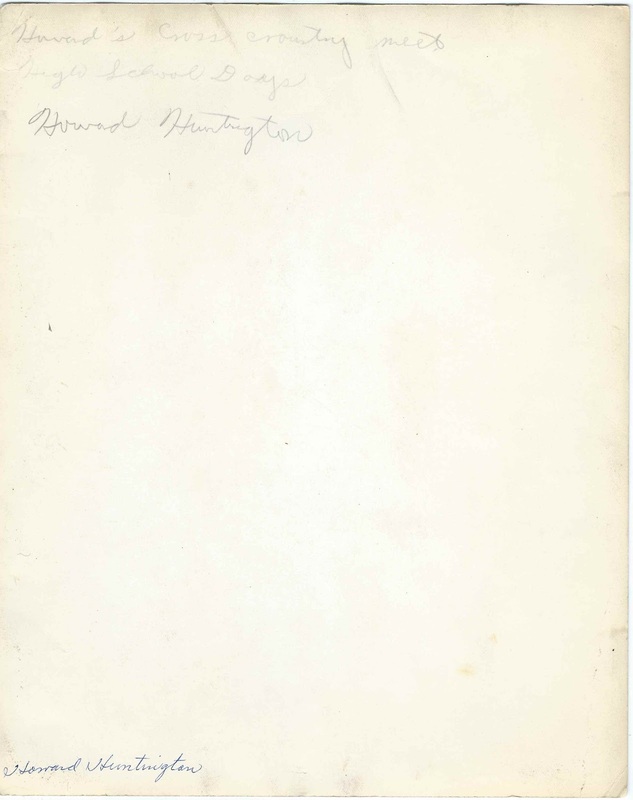 Howard Eugene Huntington was born in 1925, the son of Kenneth E. Huntington and Ivy Alice (Merrill) Huntington. Howard married Gladys J. French in 1945. They had three daughters and were active citizens in the Dover-Foxcroft area. Howard died in 2002; there are scholarships at Foxcroft-Academy in his memory. If you have corrections to the information above or information about any of the other people in the photographs, please leave a comment or contact me directly. Large photograph of students, presumably at Bangor, Maine. Very few of the names on the reverse are still legible. One of them is Manuel M. Epstein; a man by that name graduated from Bangor High School at Bangor, Maine, with the Class of 1925. Matted, the piece measures about 13-1/2" by 11-1/2". The photograph itself measures about 9-1/2" by 7-1/2"
The July 25, 1925 issue of the Bangor Daily News contains a photograph of seven members of the Class of 1925 of Bangor High School attending a 50th reunion at Pilots Grill restaurant. If, from your family photographs, you recognize a relative who attended Bangor High School in the 1920s, please leave a comment or contact me directly, so that I can match names to faces. c 1897-1899 photograph elderly John Insley Blair of Blairstown, New Jersey. He was a self-made entrepreneur and railroad magnate; see his papers here. "John Insley Blair 1897-1899 on his porch - Blairstown, N.J."
John and Ann, who died in 1888, are buried in the Blairstown Cemetery at Blairstown, New Jersey, along with son Marcus. Letter dated October 28 and November 5, 1860 from Sally (Bullen) Richmond and husband Eliab Richmond of Rumford, Maine, to their daughter Mrs. Aurelia Malvina (Richmond) Plummer, wife of Charles Baker Plummer. 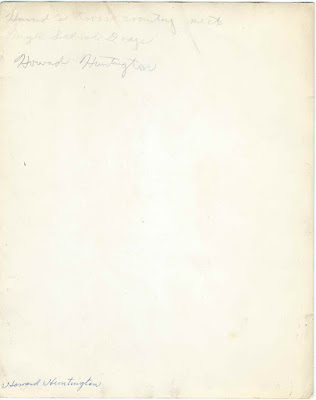 By the time of the letter, Aurelia and Charles may have been in California, where Aurelia would die around 1865, after having three children, one of them, Cora, mentioned in the letter. Or perhaps Charles had left, and Aurelia was deciding whether to join him or stay in New England for the time being. Transcription at the end of this post. Eliab Richmond, who carried the title Captain from his service in the militia, was born May 20, 1786 at Hebron, Maine, the son of Eliab and Hannah (Holmes) Richmond. On June 13, 1811 at Hebron, Maine, the younger Eliab married Sally Bullen, daughter of Daniel Bullen and Lydia (Rawson) Bullen. Sally was born at Rumford, Maine, on April 2, 1879. I believe Eliab and Sally had ten children, the last of which was letter recipient Aurelia Malvina, born January 31, 1834 at Rumford, Maine. Eliba died in 1867 and Sally in 1871. They're buried in the Severy Hill Cemetery at Dixfield, Maine. On April 26, 1856 at Dorchester, Massachusetts, Aurelia Malvina Richmond married Charles Baker Plummer, son of Bradford Gay Plummer and Mary (Hamlin) Plummer. Charles was born at Alna, Maine, on June 8, 1831. Their first child, Cora Plummer, mentioned in the letter, was born about 1857 in Massachusetts. Within a year or so, it appears, they had moved to California, where Charles became postmaster at Dutch Flat, California. They had two more children, Ada Plummer and Charles Bradford Plummer, born August 9, 1863. Sadly, it appears that Aurelia died about 1865. 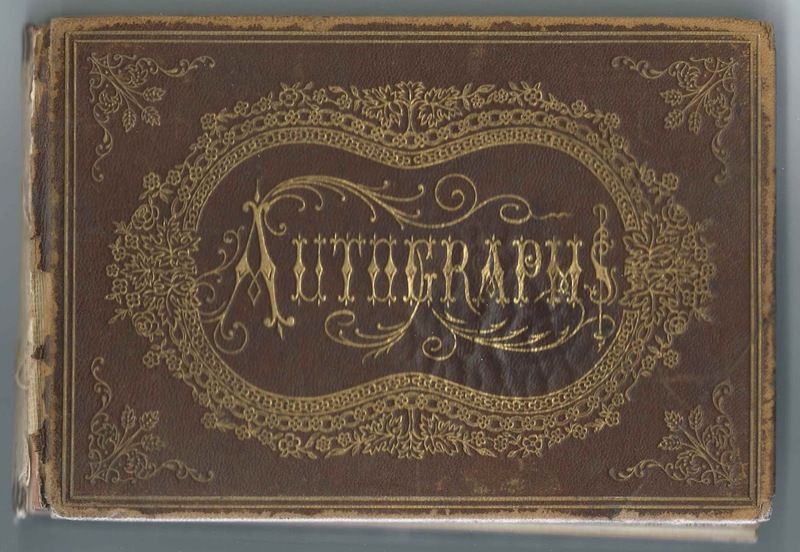 By 1870, Cora was living with the William Brown family at Napa, California, and Ada and Charles Bradford were living in the Napa household of E. W. Robinson and wife Diantha. Could their father, Charles Baker Plummer, may have been the C. B. Plummer working as an actor in 1870 at the Loon Creek Mining District at Lemhi, Idaho. Charles Bradford Plummer died in Sonoma County, California, in 1947. I haven't yet found more information on Cora and Ada. Hopefully a reader will provide an update. Dear daughter, I expect you have been waiting impatiently for answer from your last letter but I have neglected writing because I was not well last week but have got better. I have not been so unwell but what I could do my work about the house. I have spun and wove what few rolls I had then was enough to make your father one pair of [shirts; shorts ?]. We have plenty of apples have dryed some, have not got through. Dear Aurelia, I was glad to hear that you was well. that Cora had got so smart. I hope she will not be sick again. I want to see the dear little chatterbox. We should be glad to have you spend the winter with us if you think you can be comfortable here with Cora. I should be very glad to have you. When we parted last I never expected to see you again. Now I hope that I shall. Our corn crop is small but I am in hopes we shall have enough to make a few jenna cakes and pudding. The wheat is not thrashed. Our potatoes are good. I hope we shall make a live of it through the winter. I have no particular news to write so I will close by wishing you to write and let us know when you will come to Rumford. I remain your affectionate mother. I was glad to hear from you & daughter, I shall be glad to see you and Cora if you can put up with ____. I have but a small Crop but we shall have enough. Please to come as soon as may be. I wish you health and Prosperity. This in haste. Late 19th, Early 20th century photograph of a couple, presumably married or siblings. One flap has the name Sadie Bryant, but I don't know if she is the woman pictured or the recipient of the photograph. 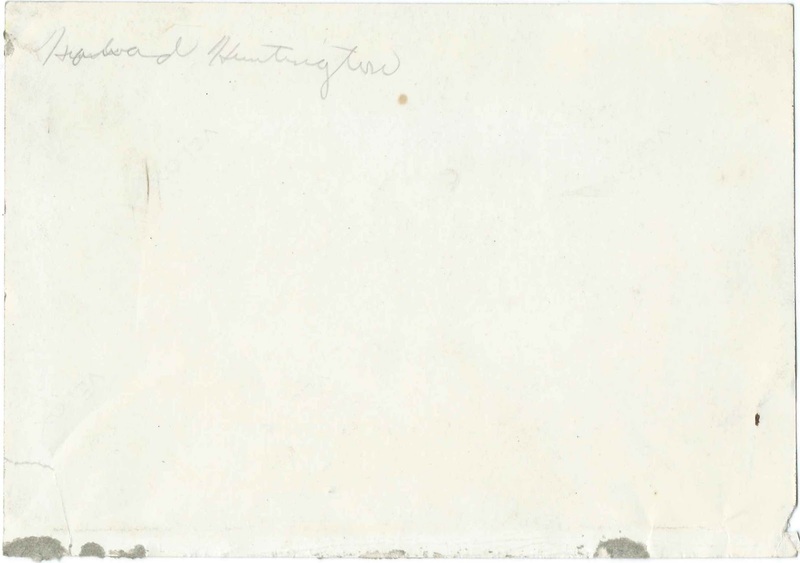 The marking is hard to read, but it appears that the photograph was taken by the Thibault studio of Middleborough, Massachusetts. If you recognize this couple from your family photos or research, please leave a comment or contact me directly. Thanks! Photograph, possibly a graduation photograph, of a young man identified on the reverse as Kenneth Erickson. The photograph was taken by the Vogue studio located at 376 Boylston Street, Boston, Massachusetts. Though there were other Kenneth Ericksons in the area, Kenneth may have been Kenneth Bryant Erickson, the brother of Harland Forrest Erickson, whose photograph on a Real Photo Postcard was featured in another post. If so, Kenneth was born September 5, 1919 at Middleborough, Massachusetts, the son of Herbert Franklin Erickson and Caroline Emma (Bryant) Erickson of Brockton, Massachusetts. He died in 2008. If you have corrections to the information above, please leave a comment or contact me directly. Please be careful with information about people living or recently deceased.